Robert Downey Jr.'s cinematic reunion with his Kiss Kiss, Bang Bang writer/director Shane Black may have a 3 after it but it's less a direct sequel to the second (slightly lackluster) Iron Man picture than it is a Tony Stark continuation of events seen in Marvel's most recent blockbuster -- the Joss Whedon helmed Stark and superfriends storm New York intergalactic smack-down The Avengers. 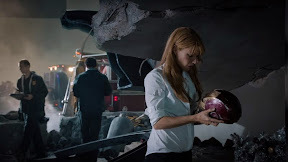 Saddled with not only insomnia but one dangerous case of post traumatic stress disorder that's caused serious alarm in his longtime (and now live-in) love Pepper Potts (Gwyneth Paltrow), Stark unsuccessfully tries to hide his panic attacks from those around him. 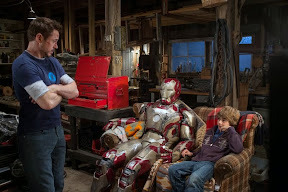 Determined to keep Pepper safe from threats real or perceived, Stark sublimates his unease with over-preparation, arming himself to the teeth should World War III break out anytime soon -- building souped-up suits in his basement lab. Like a gun shown in the first act that we just know will go off in the third, Tony gets a chance to send said suits into battle in a stunning sequence late into the picture but luckily for viewers, Black's film has more on its mind than mere visual fireworks (even though we get plenty of those for good measure as well). Using comic book writer Warren Ellis's 2005-2006 Extremis storyline as fodder for their 130 minute opus, Black and British screenwriter Drew Pearce (who's penning the upcoming Sherlock Holmes 3 and MI5 installments), forge a satisfying arc for Stark reaching back to plant the seeds for villains Guy Pearce and Ben Kingsley in an intriguing origin story fashion. Sending us back in time to Switzerland on the eve of the new millennium before Stark ever set foot in Afghanistan, we find the former party boy so busy trying to bed brainy botanist beauty Rebecca Hall that he blows off dweeby Guy Pearce in a cruel fashion, not realizing his thoughtless prank has created an enemy who will return to settle the score as the film picks up speed in the present. 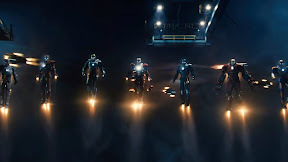 Although comic purists were angry that the character of the evil Mandarin had been altered in a surprisingly satirical way, the payoff is excellent and solidifies the human element of the screenplay -- reminding us that the reason Marvel's movies move us so well is because rather than capes or costumes, the pictures are about fully dimensional people and Iron Man 3 is no exception. This is best evidenced in the film's second act -- compared to Sullivan's Travels by some -- by way of Back to the Future in my eyes and made me wonder what Shane Black would've done with Last Action Hero had he had the chance to work on it as Tony Stark gets his own version of a boy wonder while cracking wise with a young Tennessee boy named Harley (Ty Simpkins). Nicely slowing the pace to give us a moment to let the story unfold naturally, Iron Man's marriage of ideal casting and strong storytelling meld nicely, which couldn't have come at a better time as -- especially at home -- regardless of its stunning Blu-ray quality, some of the effects are lost in transition in screen size and projection from the cineplex as it gives off a slight video game feel during an otherwise bravura attack at Stark's Malibu home. 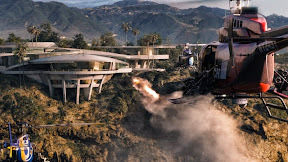 More Mission Impossible in technique than its over-the-top second picture, while it's Downey's film (and indeed his trilogy) all-the-way), Iron Man 3 offers superb supporting work by the scene-stealing Simpkins and Kingsley as well as a uniformly great, if underused Pearce, Paltrow, Don Cheadle, and Hall. 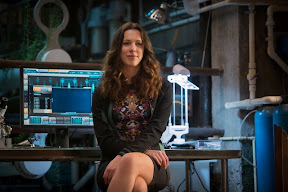 Once again, credit needs to be given to those in the casting department for thinking outside the box, as in the case of Hall going for merit rather than a model and now hopefully with the full endorsement of Marvel behind her, it might introduce a new audience to seek out her other excellent work in movies they may not have rented otherwise. 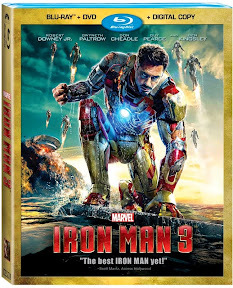 Filled with bonus featurettes and a fun post-credit payoff scene featuring one of Downey's Avengers co-stars in a cameo that actually inspires a laugh, while the production specs on the disc are predictably excellent especially the floor-rattling sound, one of the best exclusive extras is another Marvel One Shot short film featuring Captain America's Hayley Atwell as Agent Carter. A daring agent ready to bust out of her '40s era male dominated office (run by Bradley Whitford) to take down the notorious villain Zodiac on her own, the reception for Agent Carter and indeed, Marvel's first primetime ABC series Agents of S.H.I.E.L.D. have been so glowing that there are rumors a TV spin-off of Carter may soon be in the works. Text ©2013, Film Intuition, LLC; All Rights Reserved. http://www.filmintuition.com Unauthorized Reproduction or Publication Elsewhere is Strictly Prohibited and in violation of the Digital Millennium Copyright Act. FTC Disclosure: Per standard professional practice, I may have received a review copy of this title in order to evaluate it for my readers, which had no impact whatsoever on whether or not it received a favorable or unfavorable critique.